This week in Venice I've been on a mission to visit and photograph some of the city's striking and stylish interiors: https://www.instagram.com/explore/tags/ihvenicestyle/. 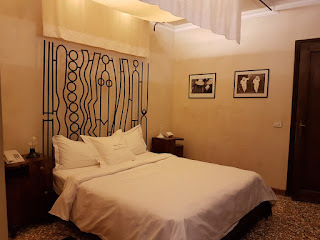 As part of the project I decided to book a night at a hotel in Venice that does something a bit different with its interior design, the Novecento Boutique Hotel. 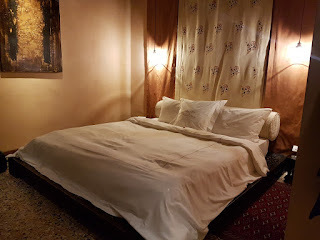 This was a cheap time for hotels in Venice, and I paid a reasonable €105 (plus city tax) for one night in a double room single use (two people would have paid more). The hotel is easy to get to - it helps if you know Venice or check a map - with just a few minutes to walk and two bridges to cross from the vaporetto stop Giglio, served by the Alilaguna ferry from Venice Marco Polo Airport. 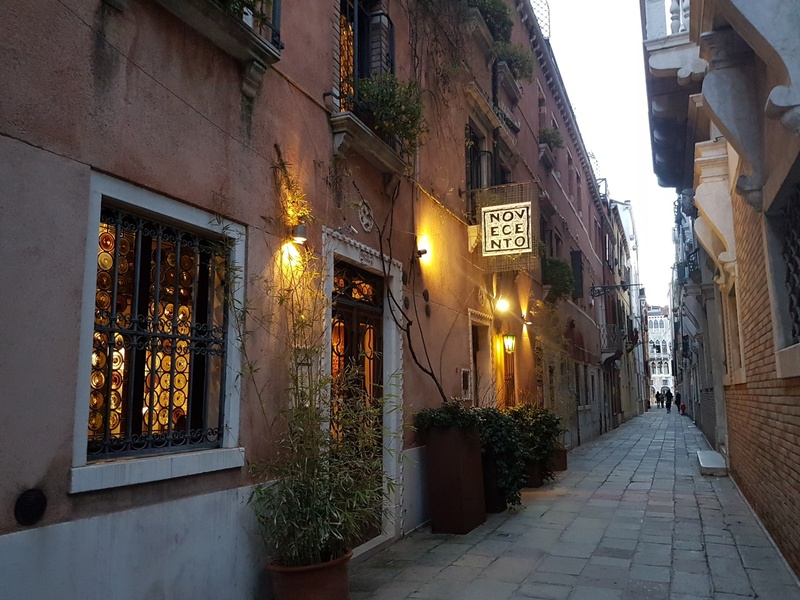 On a narrow lane between Campo San Maurizio and the Grand Canal, this is a quiet stop just off the beaten track, but only about ten minutes' walk from St Mark's Square and not far from where the Accademia bridge crosses into the arty Dorsoduro district. From the discreet exterior into the reception lobby, the hotel sets out its agenda: welcoming, stylish and cared-for, but understated. Most of Venice's smarter hotels set out to impress in the 'grand palace' style with gilding and gaudiness. The Novecento is inspired by a more 'lived-in' era, the cosier style of the beginning of the last century (hence the name). If, like me, you have visited the museum at Palazzo Fortuny and loved the bohemian eclecticism created by designer Mariano Fortuny (1871-1949), then this is your kind of Venetian dwelling. 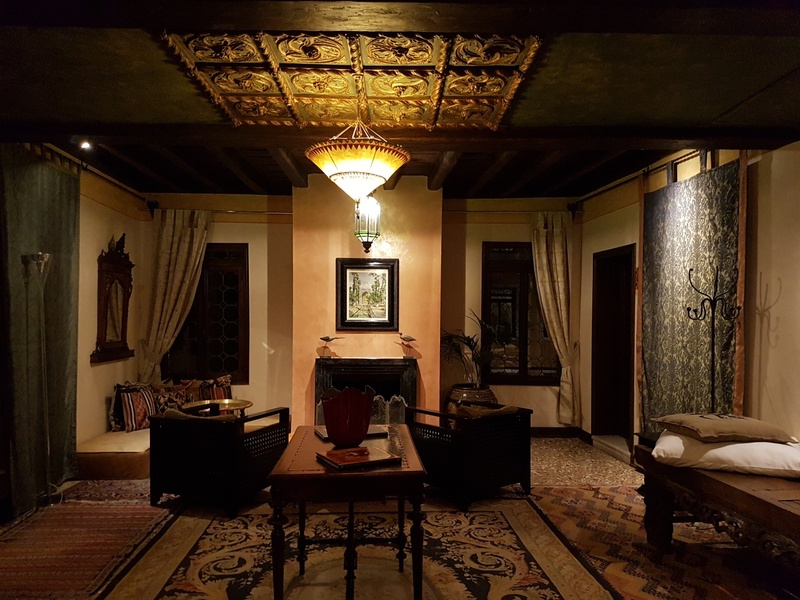 There are only nine rooms in the family-run hotel, and each is styled differently. After a friendly welcome I was shown up to room 1 on the first floor - there's no lift, but I was helped with my luggage. This stylish room was a very pleasant and practical space, comfortable and classy at the same time. Coloured glass in the windows and handsome old furniture complemented the traditional Venetian terrazzo flooring and the striking metal headstead. I also liked the drapes over the bed and the welcome chocolate. With a suitcase stand, wardrobe, table and chairs, it had all I needed for a comfortable stay. The bathroom was small but decent, though I'd have preferred a curtain or blind for the coloured-glass window. Unfortunately when I visited the hotel was awaiting an electrician to fix a beeping alarm. As this was faintly audible in my room, the receptionist suggested switching to an alternative bedroom (in fact, they'd fixed the beeping by bedtime). So I packed up again and moved to a second-floor room off the wide salon, room 6. 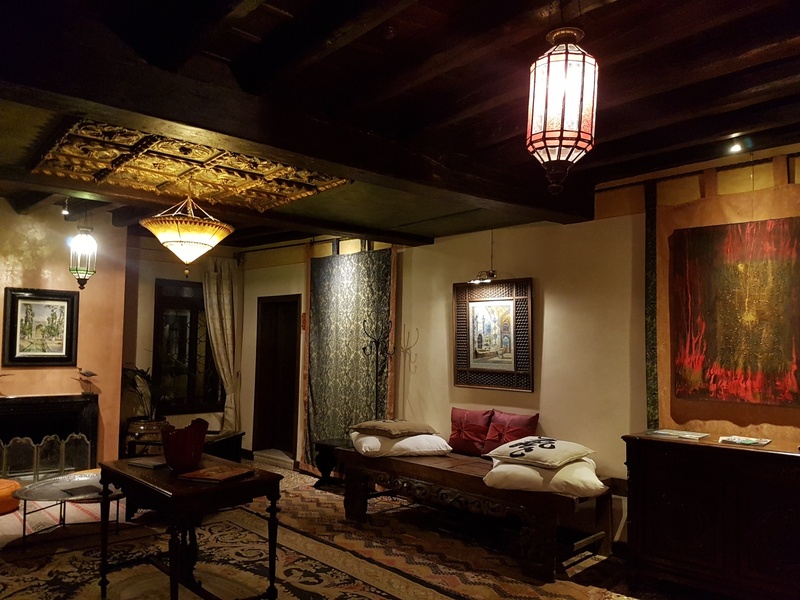 In an Eastern-inspired style, this room had cream and gold hangings and a low bed on a carved wooden platform. 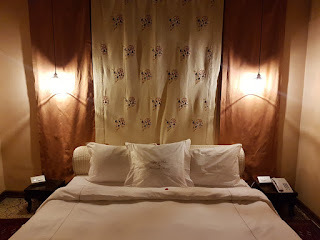 Though the look was striking, I wasn't personally keen on the low height of the bed, and I wondered if older guests or those with knee problems might find this a challenge. 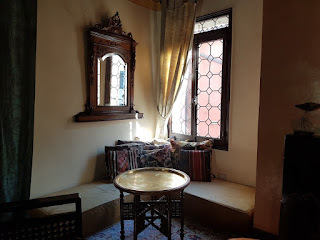 The two chairs in the room were small and wooden, so without sinking to below knee-height on the bed, there was nowhere to sit and relax in the room. The comfortable seating areas in the attractive and empty salon outside, however, perhaps made up for this. 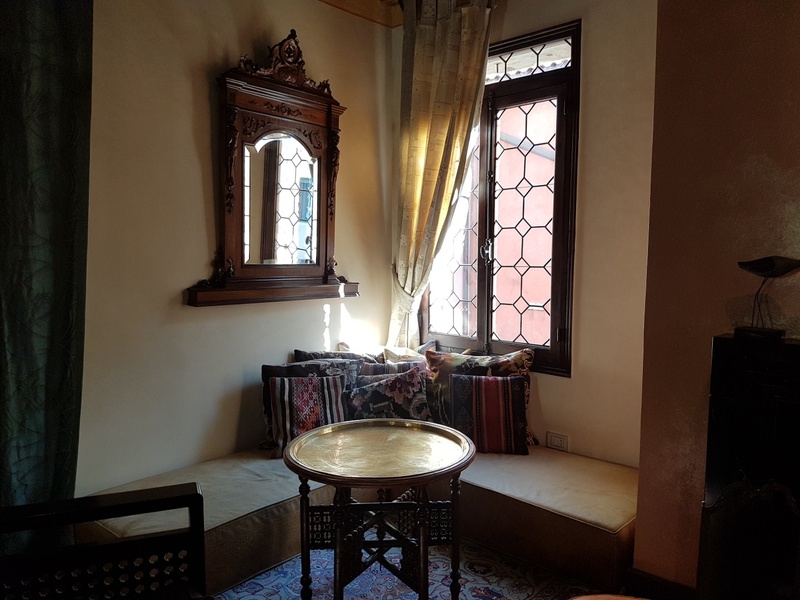 This room looked out over the hotel's small courtyard and other courtyard gardens, which provided a quiet and interesting perspective. The bathroom was larger than that of my previous room, with a double-width shower with two shower heads (showering a deux?) plus a rainfall shower head. Both rooms were warm - very important in Venice in winter - with heating that the guest could control. The style, textures and fabrics added to the temperature to give a feeling of cosiness and comfort. I was impressed with the hotel's care for details and generosity as well as its appearance. 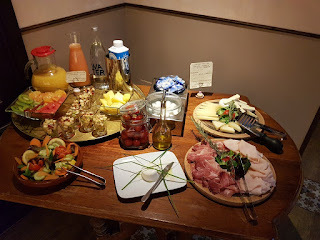 There was free drinking water in the bedrooms as well as a little welcome chocolate on the bed, and a self-service array of hot drinks and cake in the afternoon in the nice little bar/breakfast room on the ground floor - very welcome on arrival, as well as an 'honesty bar' for alcoholic drinks. 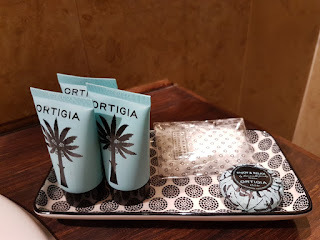 Toiletries were good quality Ortygia products. On departure I was presented with a little packet of Venetian biscuits to take with me. 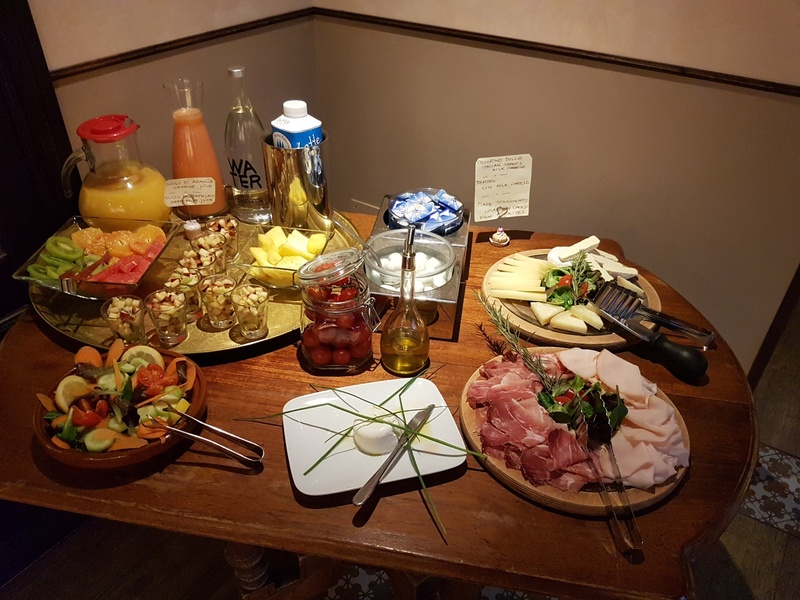 Breakfast was an excellent spread - more delicious cake, along with pastries, yoghurts, a good choice of fruits and fresh fruit salad, bread, carefully-labelled local cheeses and cold meat, eggs prepared on request. 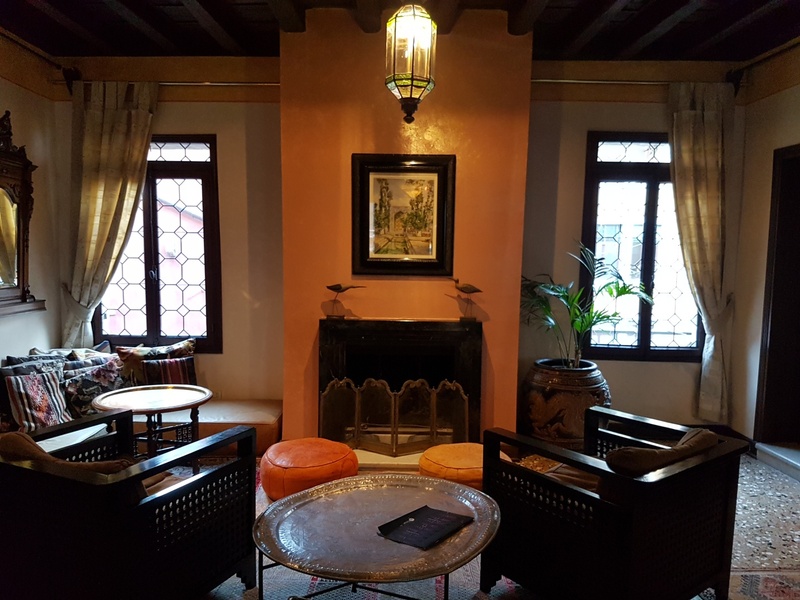 As well as this ground-floor public space, guests could also relax in the large salon on the second floor, a typical Venetian reception room running the width of the building, furnished with the same eclectic bohemian style as the rest of the hotel. With bookshelves to browse, armchairs to sink in, paintings, piled cushions and objets d'art, sitting in this hall felt like featuring in a lifestyle magazine. 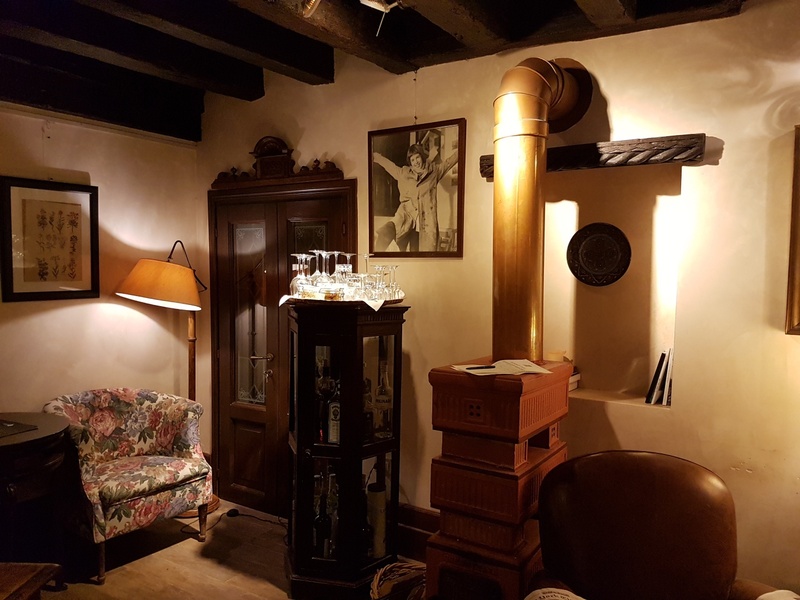 I enjoyed my one-night stay and I would be very happy to return or to recommend the Novecento to friends and relatives. The atmosphere was much warmer and friendlier than is typical for Venice, and I loved the hotel's ambience, stylish but cosy at the same time. 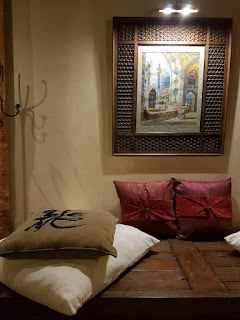 My only reservation over the hotel's style was the burbling music played in public areas; I don't appreciate it when hotels do this, but other guests may do. 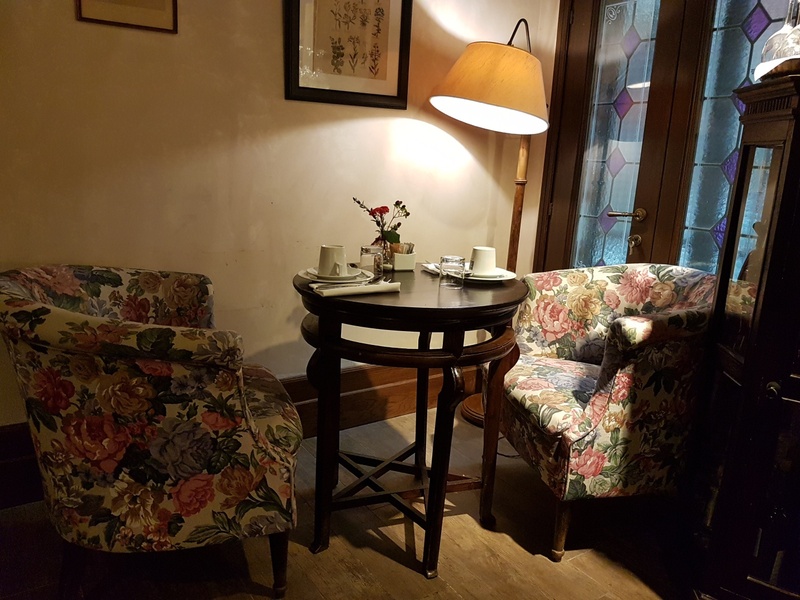 The little extras like free afternoon tea really add to a stay, particularly a longer stay. 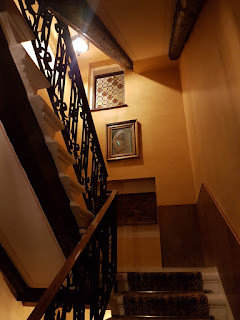 The noise problem in my first room was resolved very quickly and pro-actively, and although I didn't love the second room quite as much, I would say that was very much personal taste. A day later, thinking about my stay, I've realized what the quality was that impressed me at the Novecento hotel. It was authenticity. I looked around another Venetian hotel just before writing this review, and like so many, it gave the impression of being furnished by interior designers on behalf of commercial investors to give an approximation of what they thought the largest possible number of international guests would want in a hotel. Everything felt a bit too shiny, a bit too random and a bit too unconvincing. In contrast, the Novecento was the real deal. All the furnishings and designs were individual and obviously chosen with genuine care, enthusiasm and personal attention to detail. For me, that worked really well. If you want to spend a while getting to know Venice, particularly if you're interested in a slightly alternative slant on the city's style, I think you probably couldn't do better than this hotel. And if you stay here and like the hotel's interior design, don't miss a chance to visit Palazzo Fortuny, a short walk away, which is open for regular exhibitions. NOTE: I travel independently and anonymously, and pay for my accommodation. If you make a booking through the links on this page, you will be helping to support the Italy Heaven website through a small commission paid by Booking.com, who have a price guarantee to ensure you don't pay any extra for using their services. Thank you! 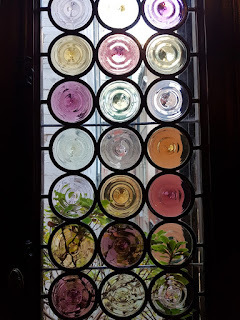 I've indulged in some spending sprees in Italy over the last few months - on planned purchases in favourite shops, and on fortunate chance finds. 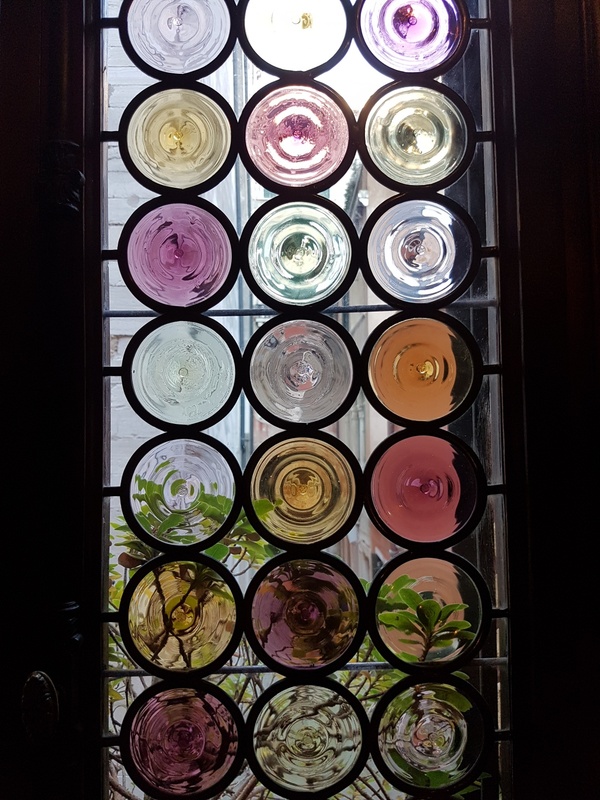 In this article I'll share some of my current favourite shops and boutiques, along with suggestions for good things to purchase - specifically in Venice, Rome and Sicily, though some of the ideas and brands will be relevant to other Italian destinations too. I'm focussing on clothes and accessories today, and won't be covering food, handicrafts and other highlights of Italian holiday shopping. 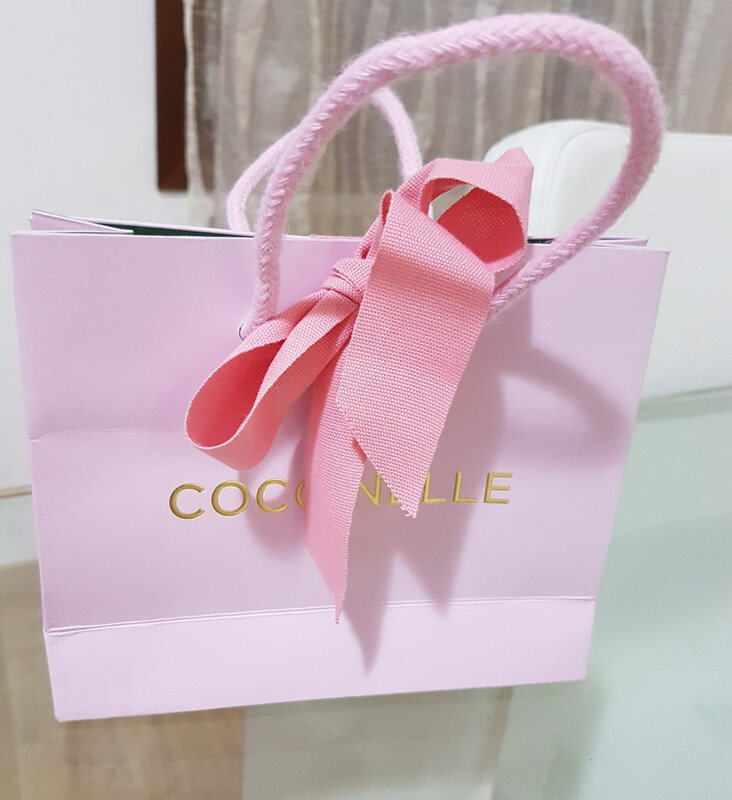 I find that shopping while travelling is a great way to refresh my wardrobe while also acquiring items that, like souvenirs, will remind me of my holidays every time I wear them. I discover clothes and accessories that are nicer, better-made or simply different to the versions on sale in other countries. Also, shoes, clothes and accessories bought in a particular location are usually perfect for that destination's climate and conventions, so you can replenish your holiday capsule wardrobe, and wear your new items right away for maximum usefulness. Just make sure that you've got space in your suitcase to take them home. Italy's cities are increasingly filled with the same chain stores you'll find in every European city: Zara, H&M etc. Although these aren't Italian, they may carry different stock to your local branch, and it's worth knowing that prices can be very different. In the spring I tried on a Zara jacket in London, priced at £79.99. I saw the same jacket priced at €59.99 on their Italian website, so I bought it on my next trip to Rome, where there is a big branch on Via del Corso. 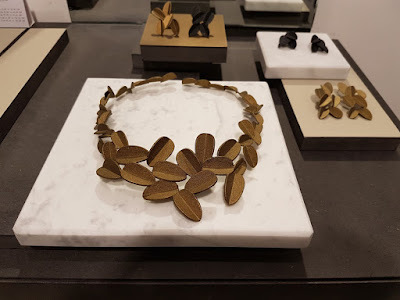 If you're looking for cheap and cheerful additions to your holiday wardrobe - a cover-up, a t-shirt - these chains can a safe bet and are becoming ubiquitous in Italy. Italy has a great tradition of high-quality artisan products. You can still find excellent local shoe-makers and leather-workers in most towns, as well as jewellery designers. Larger towns often have a district where smaller, individual boutiques are located, so checking with a local guide or at your hotel can be a good start. Different regions also have different specialities - for example, coral jewellery in Sardinia. Italy's big fashion houses - Gucci, Armani, Prada etc. - don't need any introduction, and branches of these are easily found. Check the prices online though, as there may not be any saving to buying designer goods in Italy rather than your home country. Local high-street brands include Benetton (good for staples, variable quality) and its sister Sisley (more fashionable). Cheap Italian make-up brand Kiko can be found in the UK, but products are cheaper in Italy: it's a good shop for interesting lipstick colours, eye-shadows, and make-up to experiment with. High-street shoe shop Bata isn't Italian, but as it has no UK presence, I've found the branches in Venice and Rome very useful over the years for well-designed and comfortable shoes (good for a wider fit) which last a long time. Italy still has a lot of traditional small clothes stores, selling either their own designs or a curated selection. These may look unpromising or daunting at first, but even if the styles in the window are too Italian, too middle-aged, or too youthful, Italians have a very good eye for quality and cut, and among the 'unsuitables' you'll usually find good-quality individual items which work very well for a different look. Classic pieces such as knitwear or white shirts, sometimes with a twist, are often distributed among the more exaggerated styles. Underwear can be a good buy, too, and though many international visitors will have access at home to Intimissimi, Calzedonia and other Italian brands, these can be cheaper in Italy. For several years Intimissimi has been selling attractive pure silk nighties/slips (they call them 'baby-dolls'), different colours each season and reduced in the sales. These are excellent quality for the price and wash well on a delicates cycle. Accessories are a really big thing here, though at the lower end of the market, not many of the leather bags you see on market stalls are really made in Italy these days. Hunting around can lead to some good-value finds, though, whether in markets or artisan boutiques. Big names for leather bags include Furla and Coccinelle, but every town will have its own local handbag shop(s) which may be more interesting and better value. 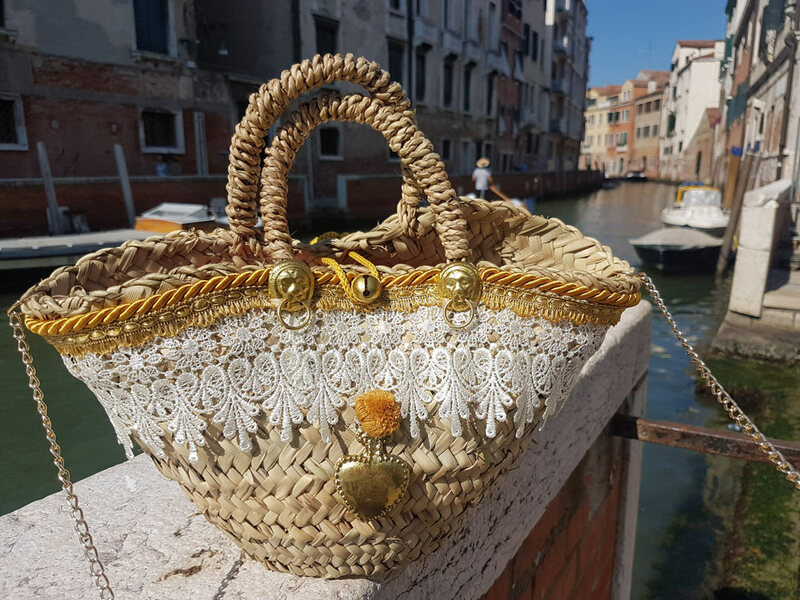 In Sicily, as well as leather, you'll find the traditional woven bag called a coffa siciliana (more on these below). 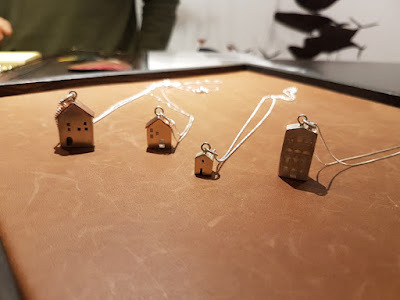 I enjoy looking for jewellery, particularly if it has a local theme, is made by a local jeweller or uses characteristic local materials. One of my favourite finds was a bronze necklace engraved with the Etruscan alphabet designed by Tuscany-based sculptor Antonio Massarutto. Scarves are a staple of every Italian's wardrobe, and there are scarves for every season in the shops here, from colourful silk scarves to stylish wool mufflers. I've even experimented with those cheap tourist square scarves decorated with local scenes; there's something appealingly timeless about them. Gloves are another excellent buy in Italy, and there are good leather glove shops in most tourist areas: big names like Sermoneta and more local brands. They're an expensive treat, but Italian gloves are high quality, usually last well, and can add the luxurious finishing touch to a winter outfit. 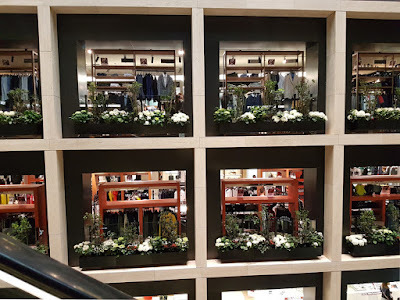 Italy is very fashion-conscious, and the local style varies across the country (generally, simpler and more chic in the north, blingier, brasher and more colourful in the south, lots of black worn in Milan). But throughout the country there is also a great appreciation of well-made, flattering classics, as well as long-term trends like lightweight summer blouses, statement jewellery and trousers to suit different shapes, and these can be very good buys. Keep an eye open for the work of local designers, artisans and graphic designers: even in the smallest destinations you might find workshops where young local artists produce unique and quirky accessories, printed clothes and souvenirs, often inspired by their surroundings. Look out for craft markets too, especially around Christmas, for the chance to browse special one-off items and chat with their creators. This hot summer in the UK has made me very glad of all the summer clothes I've acquired over the years in Italy. When the weather is really hot, typical north-European summer clothing doesn't work: the styles in UK shops, for example, are often thick fabrics, stiff, lined, close-fitted or requiring substantial under-garments. Italians dress well for the heat as they are used to it - and not obsessed with baring their skin to the sun. 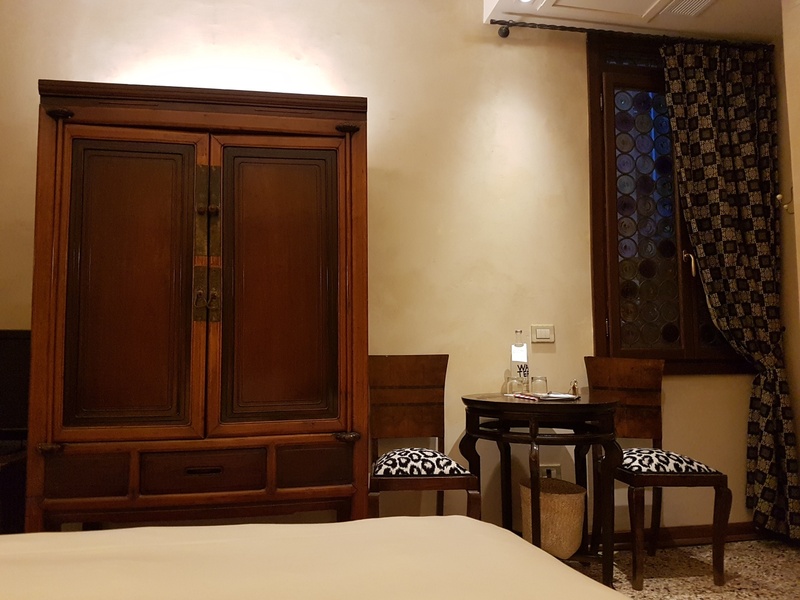 Lightweight single-layer dresses in cotton and linen, thin long-sleeved shirts and blouses and summery silk/cotton/linen trousers are among the things I find easily in Italy but with difficulty in the UK. 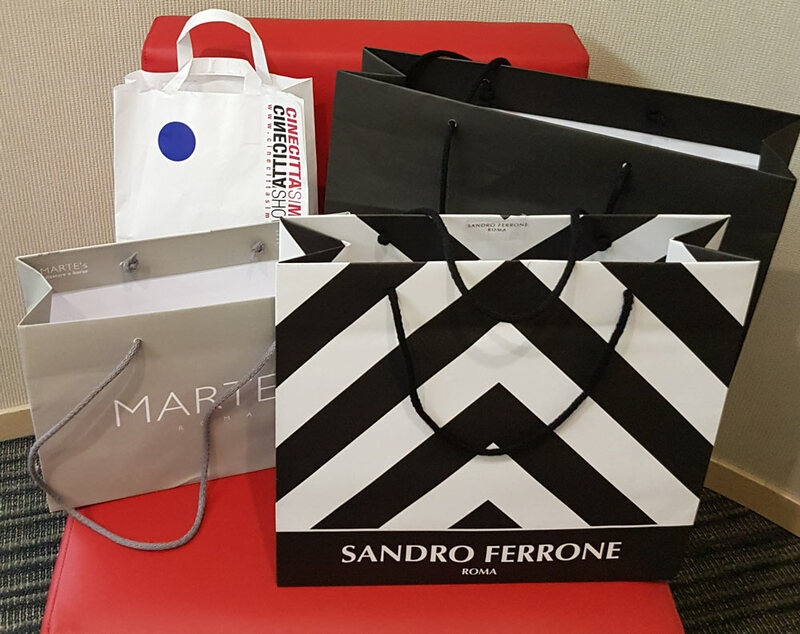 As well as for the travel-memories and the product-quality, I also enjoy shopping in Italy because it is a pleasant experience. 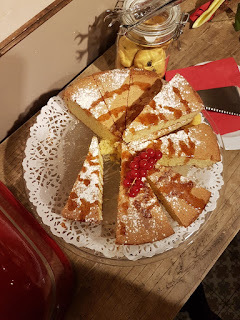 Stores are open late, so you can pop in during your evening passeggiata for a browse and a chat. 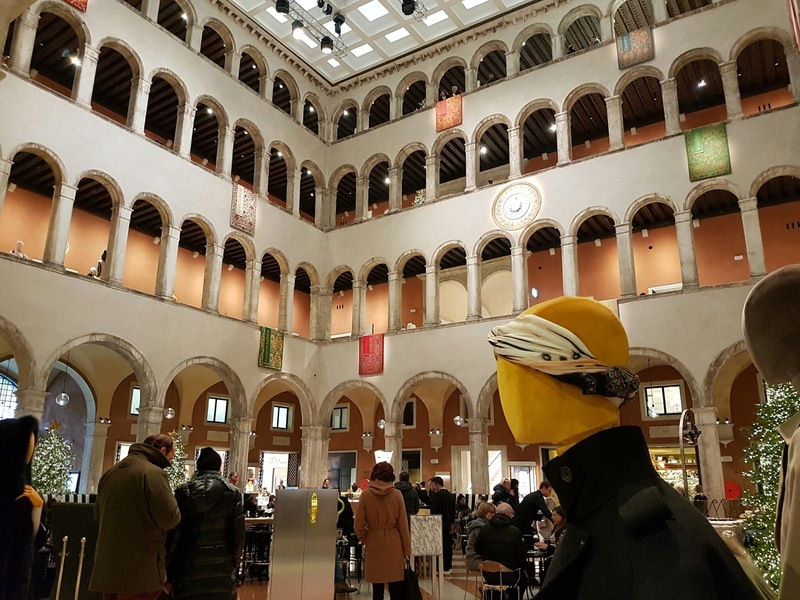 Some larger stores have interesting premises where you can visit a roof terrace, eat informally, or see archaeological remains - for example, the new Rinascente in Rome, and Fondaco dei Tedeschi in Venice. Mostly, though, I like popping into smaller stores when they're not busy. In Venice in particular I've found sales advisors can be very friendly and chatty. Occasionally there's a hard sell, but often I've had excellent and honest advice when trying things on, as well as long chats about all kinds of subjects from politics to perfumes. Artisan shops where you can speak with the designer/craftsperson are especially rewarding. 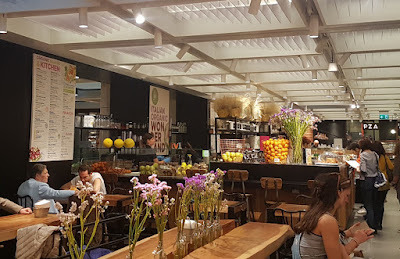 I love getting an insider perspective from local people when I travel to new places, and a lot of insights - and even friendships - have come from shopping diversions. It does help to speak Italian, but English is spoken increasingly widely. 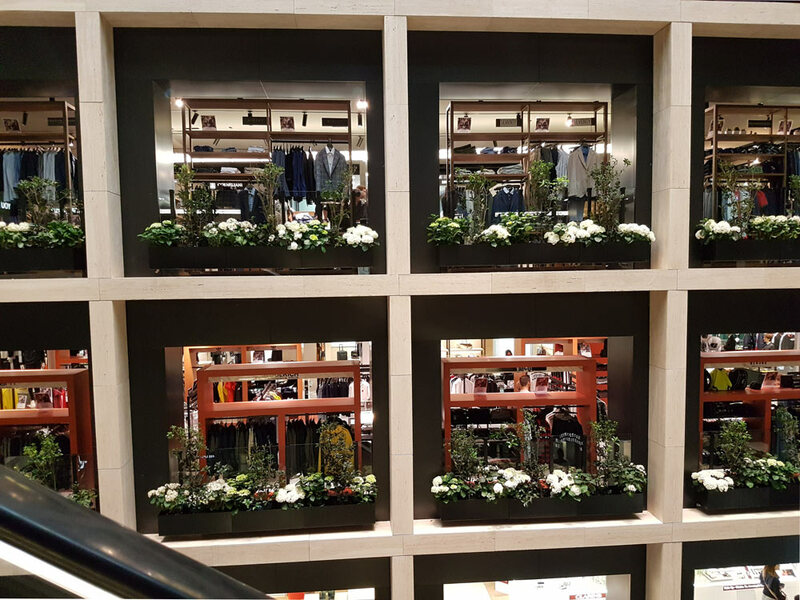 Via del Corso offers a wide range of high-street stores, among them some more individual Italian brands. The streets between Via del Corso and the Piazza di Spagna are good for higher-end clothes and accessories. 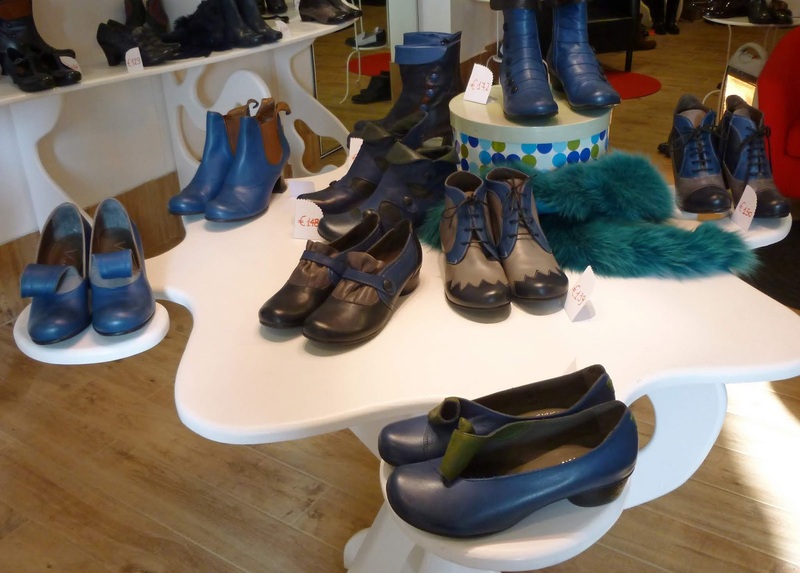 Via Nazionale has a range of more Italian high-street shops and it's where I head for affordable shoes. The little lanes around Campo dei Fiori in the historic centre and around Via dei Serpenti in the Monti district are good for quirky little boutiques, sometimes vintage-inspired and often run by cosmopolitan ex-pats, where you'll find unusual designs, interesting fabrics, one-offs, and a style which is less mainstream Italian and more international cool. 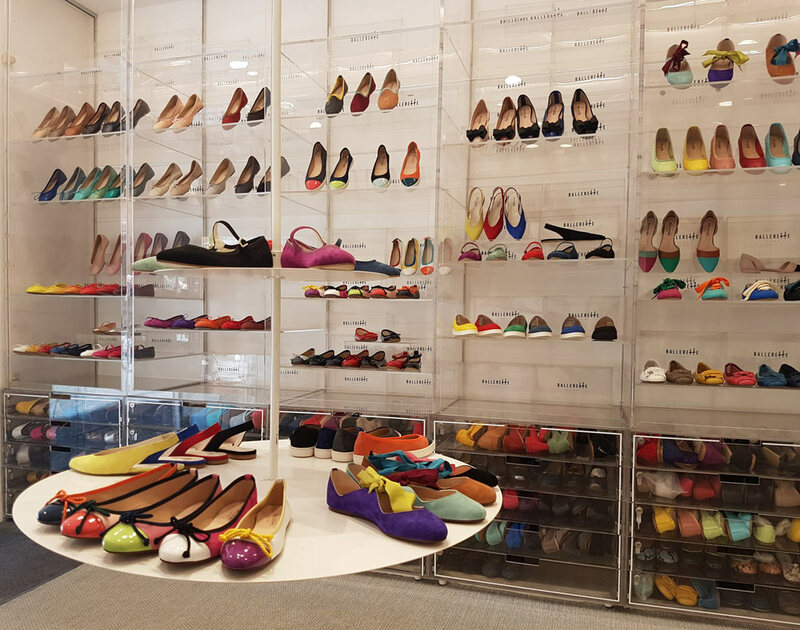 Ballerette - a shoe shop specialising in ballerina pumps, in many designs and colours, with a couple of branches in Rome and others in Florence, Milan and Venice. Sandro Ferrone - not a shop I thought was for me, this is a Roman clothing brand that is very much 'well-off older Roman lady' and possibly a little Armani in look, though cheaper in price. I reckon the target market is at least 30 years older than the models on their website. 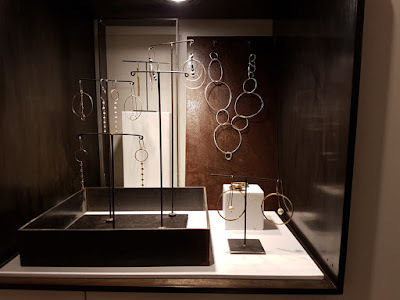 But at the shop on Via Nazionale, among the smart items for signoras I found some nice semi-formal dresses which could be dressed down or accessorized for a more youthful and less Roman look. There were also some lovely silk scarves at very reasonable prices - I bought a gorgeous parrot print which has earned several compliments and can be worn in a number of ways including as a pool cover-up. 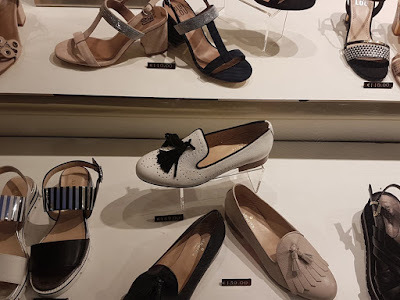 Geppy and Marte's - these two shoe stores, a short way apart on Via Nazionale, have been among my go-to destinations for cheapish, stylish flat shoes ever since I lived in Rome on a meagre Italian salary. Marte's is smarter and pricier, with better service. This year I bought some great Spanish-made ballet pumps (Wonders brand), which I found more comfortable for wide feet than the Ballerette ones. I was so pleased with the first pair I went back to buy a second colour. Geppy is cheaper, with poorer service and more variable quality, but worth looking at for their variety. My most recent purchase there was a pair of jazzy yellow lace-ups. Temporary Store - I have no idea if it's still there, as 'temporary stores' - cheap pop-up shops in vacant premises - come and go. 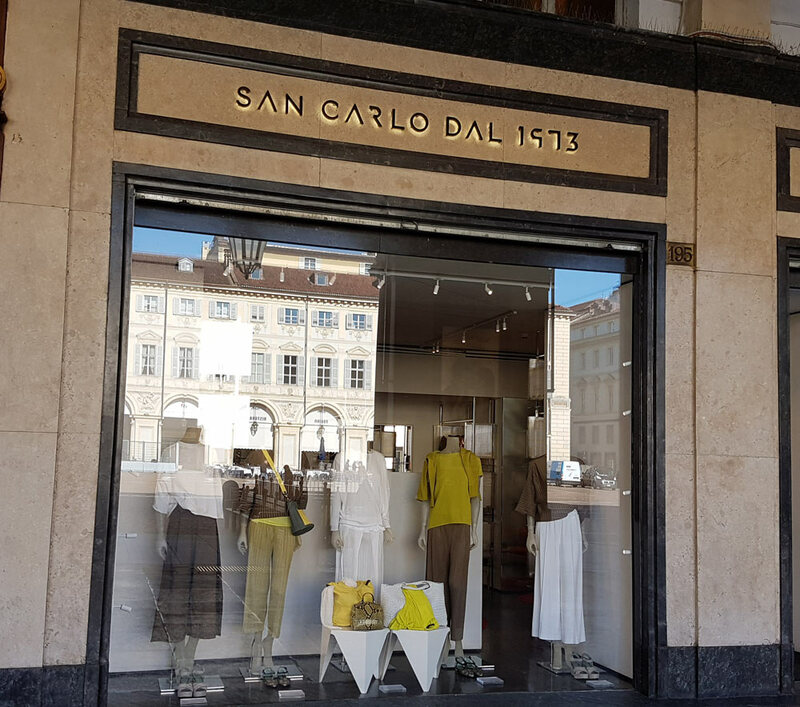 I passed this shop on Via del Corso one evening this spring and saw a nice blouse in the window - the next day I went in and came away with the blouse in two colours: thin and with flared 3/4 sleeves, the design is ideal for summer in Italy's hot climate. The blouses have had loads of compliments when I've worn them. It can be hard to find clothing suitable for Italian temperatures in the UK, so I always keep my eyes open for ultra-lightweight, natural-fibre, non-skimpy clothes. Nanà - this shop opened recently in Venice and I've had a couple of splurges, first in the excellent winter sale and then to buy clothes for summer. The brand is based in north-east Italy and clothes are made in Italy. While reflecting current fashions, I reckon the clothes are also in a certain northern Italian style, which is classier and more restrained than the South, but sometimes a little alternative. Many pieces have a more individual character than I usually expect from Italian brands. Most of the items I've bought have become staples in my wardrobe, and they've washed well. Last time I went with a wish-list from their website, had a big trying-on session, and came away with a massive shopping bag. My favourite purchases include: a winter jumper which made me feel like a bohemian Venetian, high-waisted wide-leg trousers which have been perfect for UK daytimes and summer evenings in the Sicilian islands, a lovely floor-length muslin dress, and a classy white shirt with a shoulder bow - I had a compliment on that one just yesterday. 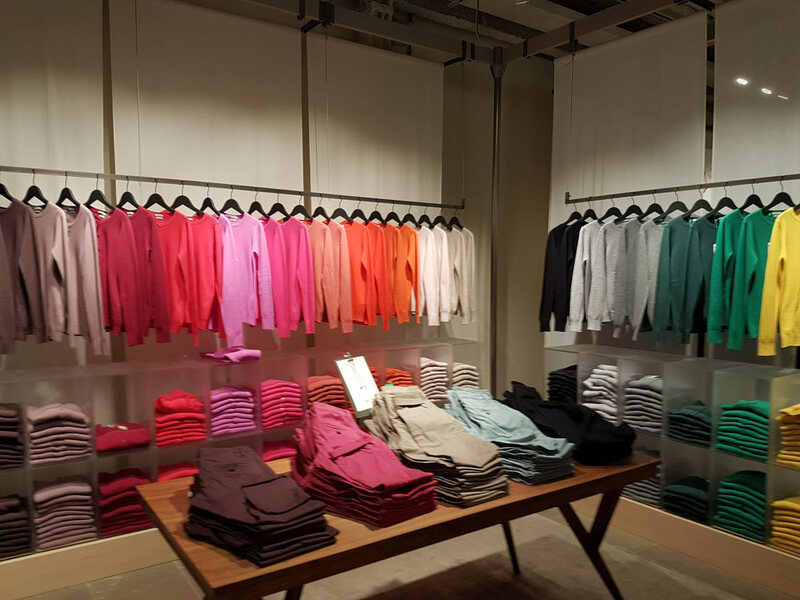 Benetton and Promod - these two chains, near the Rialto, are totally unexciting, but have been the source of some cheap basics: colourful cotton and wool jumpers, and shorts. Kiko - although there are branches in London, I had fun picking up new colourful lipsticks while passing though the lanes near St. Mark's. There are also a couple of branches of Sephora in Venice, which are good for cosmetics-lovers. I found some nice own-brand hand cream, and Shiseido sun protection lip gloss. Materialmente - a quirky little jewellery store with designs made in Venice (there's a workshop on the Giudecca). I bought a silver 'Venetian palazzo' necklace which I absolutely love. Fanny - This glove shop has two branches and friendly helpful staff - one sales advisor always remembers me and my previous purchases. They've got an excellent choice of colours, and I generally pick up a new pair each year to add to my collection. 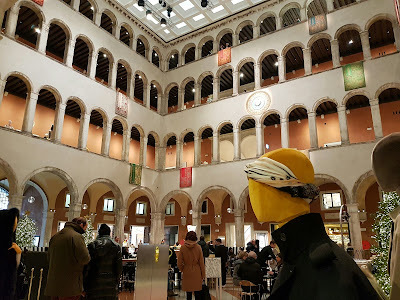 Fondaco dei Tedeschi - I don't quite approve of this luxury tourist shopping mall which occupies a historic building by the Rialto, previously Venice's post office. But it has a scenic roof terrace and is quite useful for posh foodie souvenirs, accessories and perfumes and cosmetics. I bought a couple of Diptyque bits, and got some free Italian perfume samples which I've loved from a friendly sales advisor. I've also bought one-offs in less likely shops, including a cocktail ring in handbag shop Coccinelle and a coat and jacket in the crazy Spanish chain Desigual (both in the San Marco district). Although it can take a while to get anywhere without a map in Venice, it is a great place for accidental window-shopping and impulse buys. Sicily is still more about smaller individual shops than global corporations. Some of the blingy local fashions may not appeal to foreign visitors, though they are still fascinating for window-shopping (I still remember a short-sleeved crystal-embellished blue leather jacket in a Palermo shop window). 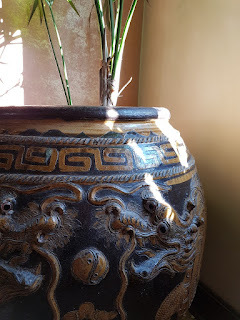 My recent shopping was on the Aeolian islands, which each have their own sense of style. Panarea is about wafting around in expensive Indonesian silk kaftans and cover-ups all in tasteful prints. I bought a short silk dress/cover-up in Bugenville Boutiqe in a blue floral print; excellent for wearing on hot days strolling, or for heading to the beach. On Lipari, Salina and Panarea you'll find boutiques with selections of Indian cotton and silk, bright bikinis and attractive printed sarongs - my favourite has a prickly-pear motif to remind me of the islands. Simpler clothes are available too - souvenir t-shirts are often tacky but among them are some excellent graphic designs featuring local motifs such as the erupting volcano Stromboli. The best shopping is on Lipari, where at the Marina Corta end of town are a range of classy boutiques selling jewellery, handicrafts, clothes and accessories. I usually return with several pieces of jewellery or other accessories, most of which I've used lots and which remind me of the islands. One of my favourite buys, years ago, was a simple obsidian arrow-head necklace. This year I bought several accessories and gifts from a delightful quirky boutique, La Casa Eoliana. The speciality here is accessories featuring traditional Sicilian motifs, including the 'Eolian heart' symbol. Glamorous owner Francesca loves the Sicilian and the Aeolian islands' distinctive characters and styles, and sells items inspired by and named after the islands and their traditions. I loved the Cuore Eoliana necklaces - beaten metal hearts suspended on beads - and the colourful versions of the Sicilian coffa. The coffa is a traditional bag hand-woven from leaves of the dwarf palm. In Sicily these were used for agricultural purposes such as carrying fodder for beasts of burden. Now they are made as handbags, large and embellished with Sicilian decorations derived from local folk-art including mirrors, pom-poms, lace-edging, images of marionettes, and painted scenes. Here, of course, they are also decorated with the Cuore Eoliana. They're excellent summer bags, and I bought a small version with a shoulder chain for practicality. 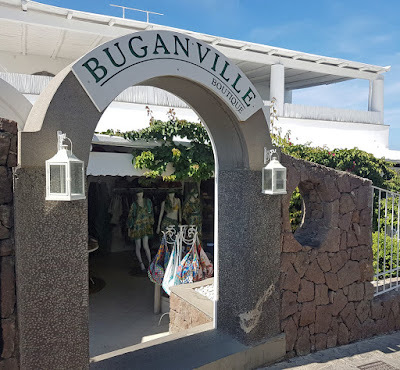 Shopping on the islands is the best way to achieve the classic island style, and though prices tend to be high, buying sarongs, floaty cover-ups, white blouses, wide silk trousers etc. here is a good way to complete your holiday wardrobe and to take clothes home which will be useful on future trips as well as reminding you of your vacation. And jewellery, of course, is a great way to carry a souvenir around with you, and update outfits at home with a reminder of Sicily. Plus, it's easy to fit into luggage. Check how much it costs you to use your credit card abroad versus how much you pay to get cash euros, as this will affect how much your purchases will actually cost, and how much cash to carry. I tend to prefer credit card for larger purchases just to give myself better protection in the event of a mishap like my suitcase going missing. If you are visiting from outside the EU you may be able to reclaim VAT on some purchases. If I'm thinking of shopping, I'll sometimes look up favourite shop websites in advance to plan what to look for and what to try on. You can order online for collection with the more organised Italian chain stores - but do allow plenty of time for the goods to reach the store. I try to leave room in my suitcase for potential purchases - although having an expandable case is also very handy. And I take a capacious folding shopping bag in case I need to pack new possessions in a convenient 'overflow' bag for returning home, when my luggage allowance permits. British Airways are quite generous with cabin bags so I recently travelled with a hold suitcase, a rucksack, and a big folding shopping bag containing my handbag and new clothes. Remember that once you've left the country you won't be able to return items or report faults, so I'd recommend examining goods very carefully before leaving the shop as well as trying them on - seams, labels, fabric, fastenings. On a final note, be aware that Italians are very entrepeneurial, and are also keen to please visitors. Especially in small shops in tourist destinations, it may be hard to judge whether items are exactly what they are said to be - real coral? genuinely local obsidian? authentically handmade, or imported from China? I'd suggest studying items closely, making the best assessment you can of the premises and products, and then only spending what an item is worth to you, as you see/feel it, rather than paying extra for any claimed value or attribute. I'm really happy with almost all the souvenirs/clothes/jewellery I've bought travelling around Italy - I wear it, look at it, enjoy it, and don't question it again once I've made the purchase decision. Loading When should I visit Venice?